Jacksonville rallies to honor mothers of the movement against police crimes | Fight Back! 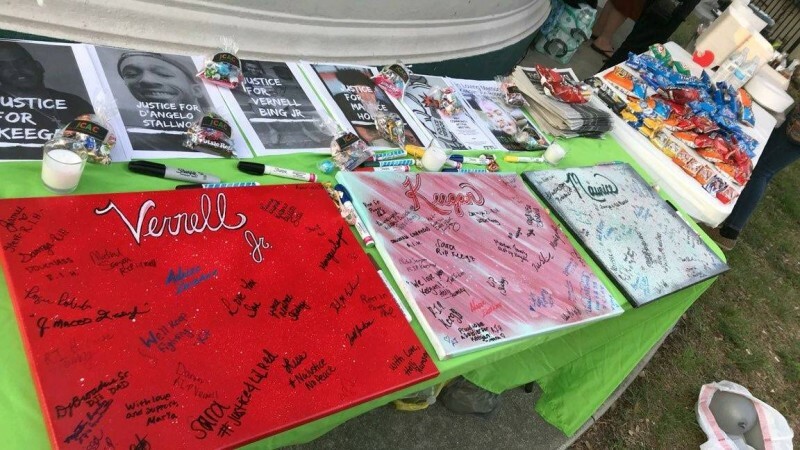 Jacksonville, FL – Over 75 people gathered in Klutho Park, May 11, to honor several mothers of the movement against police crimes, including the mothers of Keegan Von Roberts, Maurice Hobbs and Vernell Bing Jr., three Black men murdered in Jacksonville over the past two years. In all three cases, the Jacksonville Sheriff’s Office (JSO) either murdered the men (Bing Jr.), failed to prosecute the killer (Von Roberts) or refused to even investigate the murder despite having evidence about the case (Hobbs). The event was organized by the families and friends of the slain men and assisted by the Jacksonville Community Action Committee (JCAC). The rally was oriented towards exposing the corrupt justice system with State Attorney Melissa Nelson sitting at the top of a pyramid that only works for the 1%. In the struggle against police crimes, nobody is more passionate and fights harder for justice than the mothers of the movement, and the rally, two days before Mother’s Day, was focused on honoring the mothers of the movement and emphasizing their continued determination to fight for justice and combat police crimes. The mothers serve as inspiration for the movement to never give up fighting and never rest until justice is won. Several speakers told the crowd about the suffering and persecution the families of victims of police crimes faced at the hands of JSO. Some speakers led the crowd in chants including “What do we want? Justice! When do we want it? Now!” and “If we don’t get it? Shut it down!” Jacksonville Food Not Bombs (FNB) was very helpful and provided meals at the event. At the end of the rally, the mothers were presented with flowers and gifts on behalf of the JCAC and the Jacksonville Progressive Coalition (JPC) and recognized for their courage and bravery by their friends and allies. The activists vowed to continue their struggle to win justice for the victims of police crimes. Many of the participants plan to attend the upcoming JCAC meeting on Thursday, May 17 at 6:30 p.m. inside the Wells Fargo Community Learning Center located at 601 N Main Street near downtown Jacksonville.